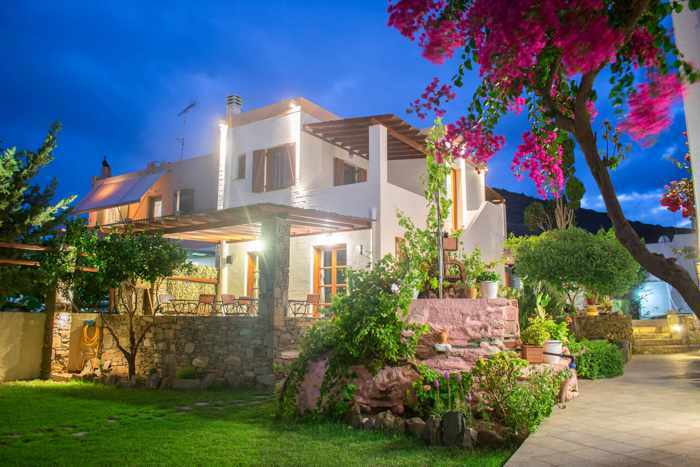 The Kini area has a wide range of accommodations, including hotels, B&Bs, self-catering rooms, studios and apartments, houses and luxury villas. Some have simple, traditional decor and basic facilities, while others are stylishly modern with contemporary amenities and services. Below is a list of most of the main hotel and apartment options in Kini. I have included links for websites, Facebook pages and booking.com listings, where available, so you can simply click to obtain more information about each place, view additional photographs, or make a reservation. I did not include rental homes or villas, or hosted private accommodations, but you can find those among the Kini listings on Airbnb and on the Kini page of booking.com. 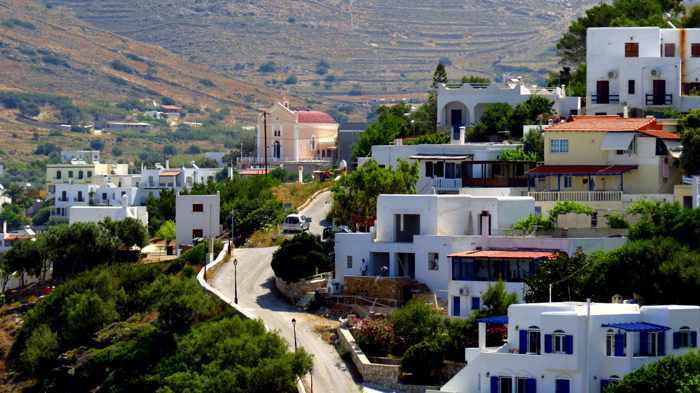 This section of the post provides a brief overview of several hotel and apartment properties situated on some of the hills that encircle Kini village. 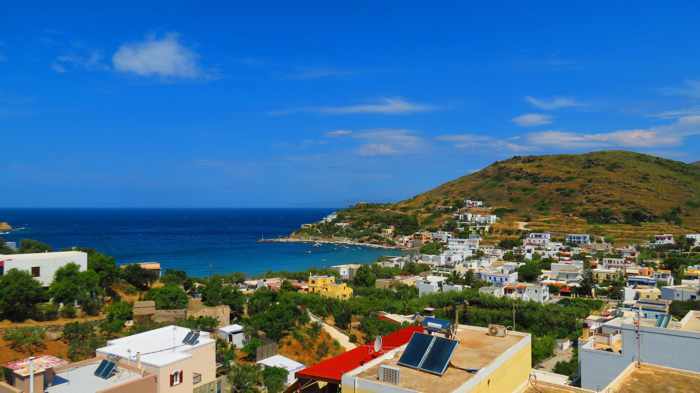 Accommodations at these places generally will offer quite impressive scenic views, usually overlooking the village, beach and bay, but the windows and balconies for some rooms may instead look to the hills and mountains surrounding Kini, or into gardens or landscaped grounds. 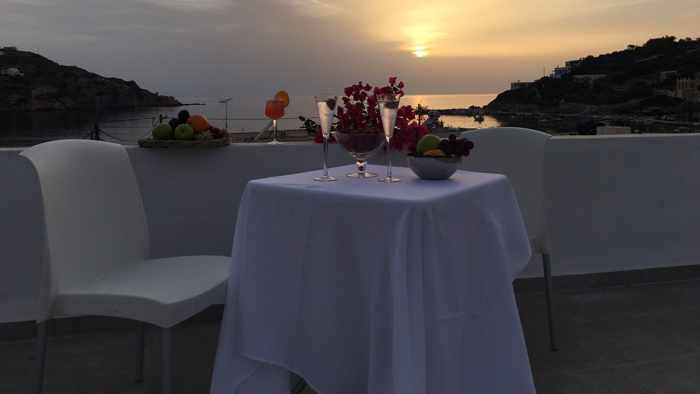 However, guests staying in such rooms generally will have access to a veranda or terrace that does have a stunning view of the village, sea and sunset. The downhill walk to the central village area from any of these properties will take about 15 minutes or less, but the uphill walk back will of course take much longer and require more effort! If you’re driving, it will take less than 5 minutes to reach one of the parking lots in the central village area. The property has six accommodation units which include four suites being renovated for the 2019 travel season, along with two recently-built Executive Suites appointed with chic minimalist decor. The suites accommodate 2 persons, but two of the units have sofa beds that can sleep an extra person. Each room is equipped with a kitchenette and is furnished with queen beds featuring ultra-comfy Coco-Mat mattresses, Nespresso coffee machines, satellite TVs, Korres personal care products, and more. The two executive suites have separate bedroom and living room areas and two bathrooms, and are furnished with king-sized beds. The property has a large open terrace with swimming pool and a bar, while the two executive suites each have private terraces with plunge pools. Photos of the rooms can be viewed on the Pino di Loto website, along with galleries packed with dozens of professional design and travel magazine-quality photos showing the hotel bar, breakfast area, swimming pool, terrace, and of course the amazing views. Scores of additional photos and videos can be seen on the Pino di Loto Facebook page, as well as on the Pino di Loto Instagram feed. I haven’t been on the hotel grounds yet — though I have passed by and peaked in the front gate — so I can’t offer any personal insights into how Pino di Loto looks and feels. However, one of the followers of my blog’s Facebook page has stayed there several times and highly recommends it, saying the accommodations and staff are absolutely wonderful. 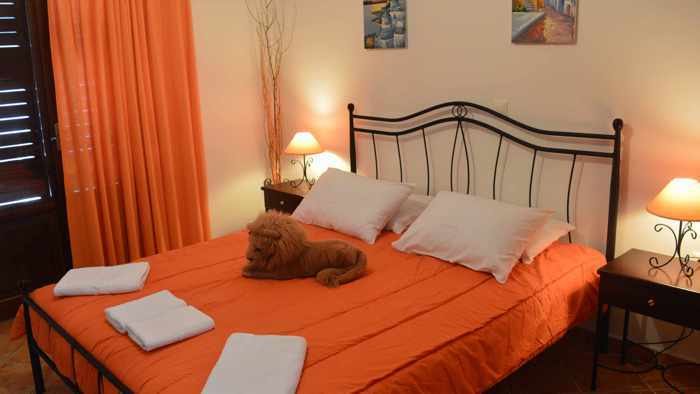 We have a particular fondness for Kini Bay Rooms & Apartments since we stayed here on both of our visits to Kini and have very happy memories of our experience. The rooms were renovated and repainted in between our two stays, and though we were completely content with the comfortable “old” decor, we found that the new furnishings and fresh, bold colour schemes greatly improved the look and feel of the rooms. 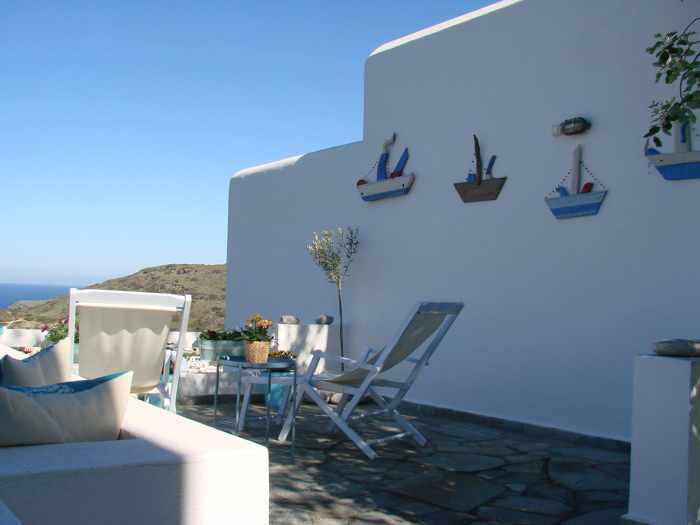 From the outside, Kini Bay Rooms has a traditional Cycladic appearance with its brilliant white walls and soft blue trim and accents. Inside, the building has 8 units, with room, apartment and studio accommodation in a variety of configurations. 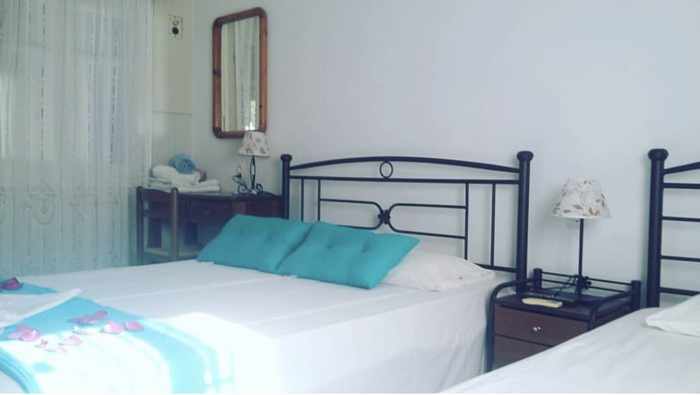 There are double and twin rooms, studios, a 2-room apartment that accommodates 4 people, and a 1-bedroom suite with a very spacious open-concept living room / dining room / kitchen, perfect for a family. 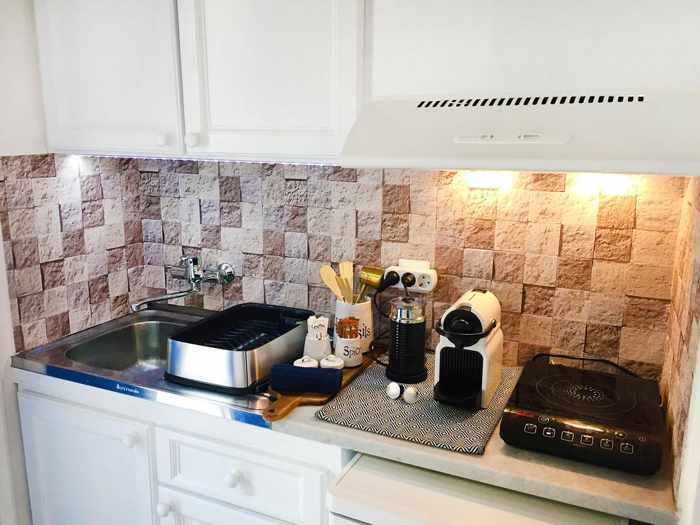 The studios and apartments have kitchenettes, while the rooms are equipped with refrigerators, toasters, kettles and coffee makers. 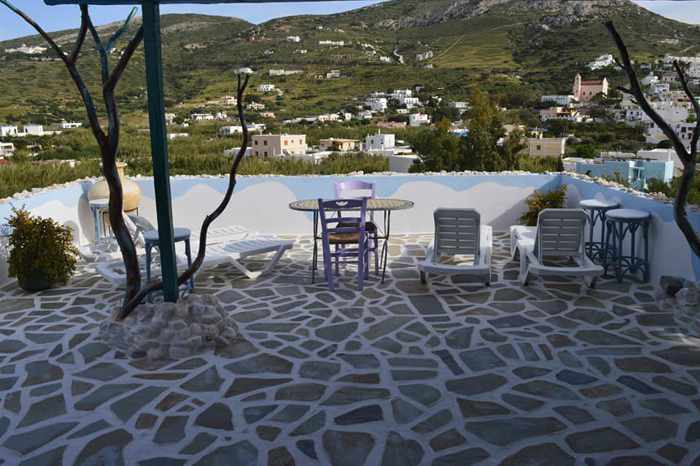 Some of the accommodations have excellent sea and village views from their private balconies or terraces, while some have garden and village views. 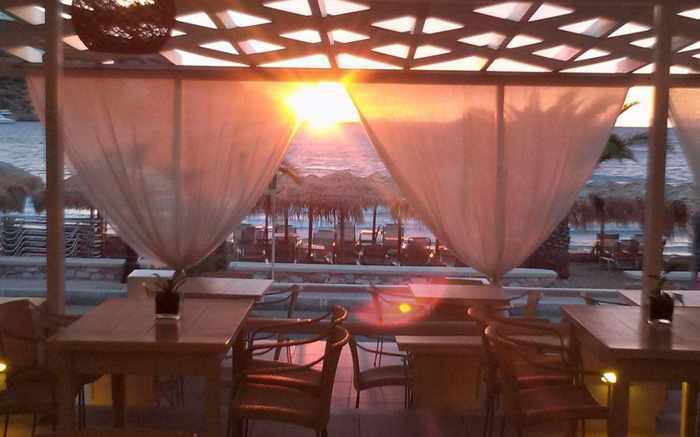 However, the building’s top floor has a huge veranda from which guests can watch sunsets and take in the panoramic views of the entire Kini area. 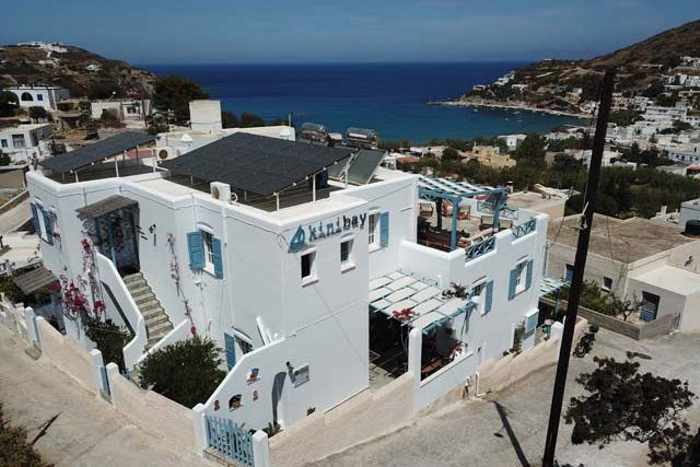 Numerous photos of the property, rooms and views can be seen on the Kini Bay website, as well as on the Kini Bay Facebook page and on the Kini Bay Instagram page. 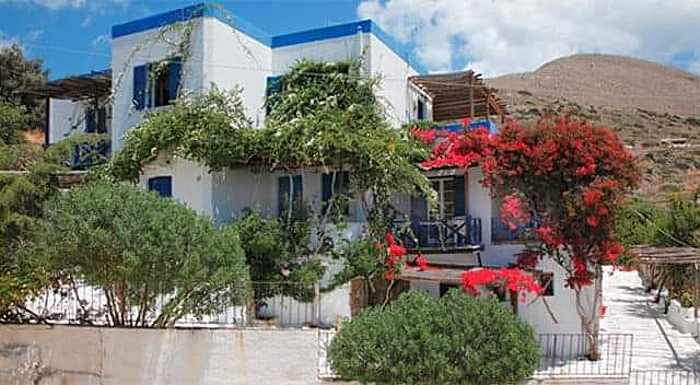 Additional information and pictures are provided in the Kini Bay listing on booking.com. 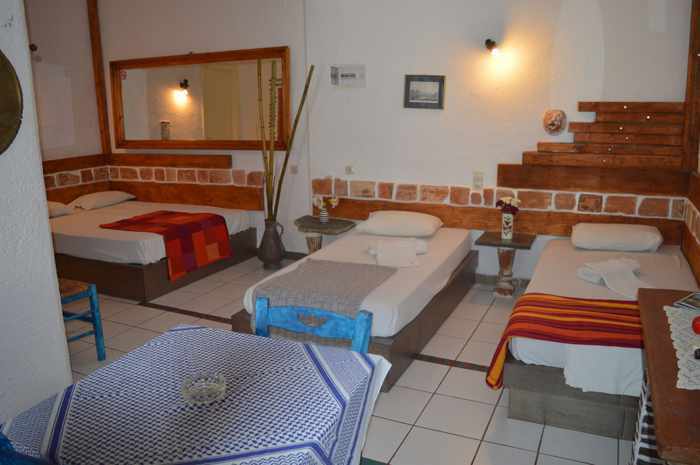 This is a hotel website photo of Room 2, in which we stayed for a week during our second trip to Kini. 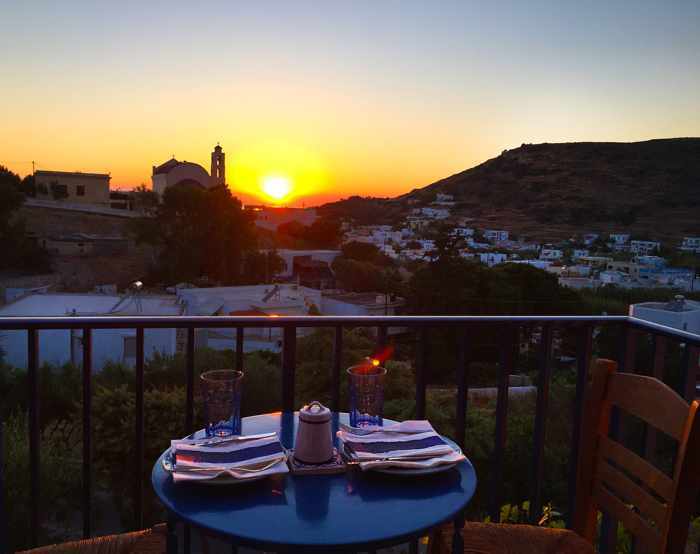 We loved spending time on the big garden terrace … it was a peaceful place to enjoy breakfast each morning and then relax in the evening after a day of exploring Syros. 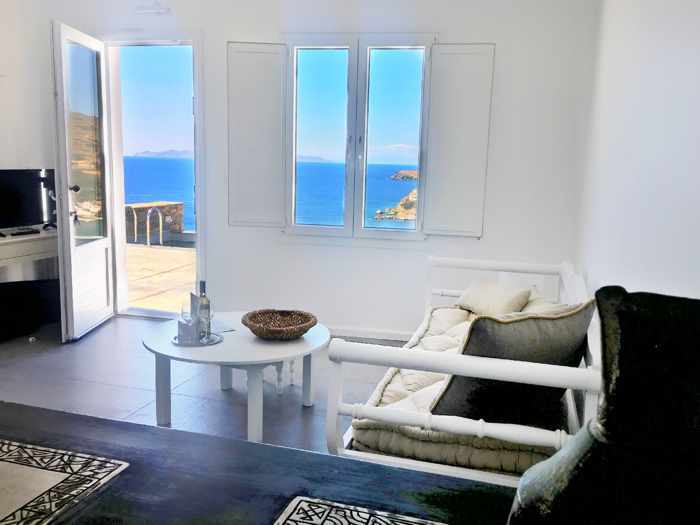 This photo, from the Kini Bay Rooms website, shows the spacious open-concept layout of the living room, dining area and full kitchen in the 2-room apartment. This suite would be ideal for a family. One of the intense sunsets we watched from the top floor veranda. 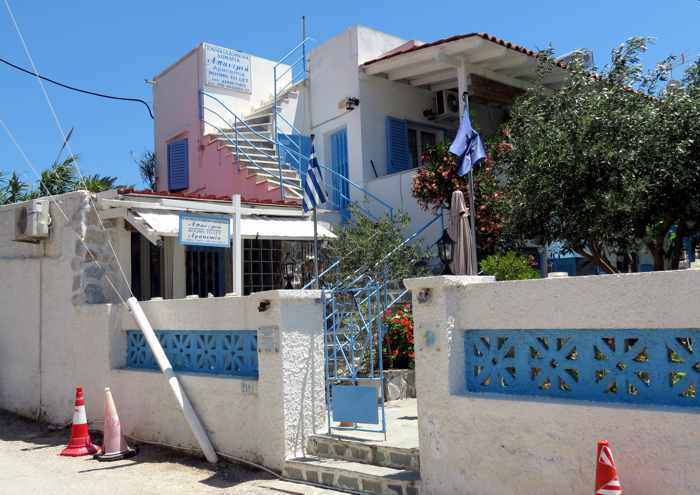 Currently undergoing renovations that will be completed in time for the 2019 Greek Easter holiday, Captain’s is a complex of 8 apartments at the top of the road that winds down the hillside into Kini village. Four of the suites can sleep up to 3 guests, while the others can accommodate 4 people. 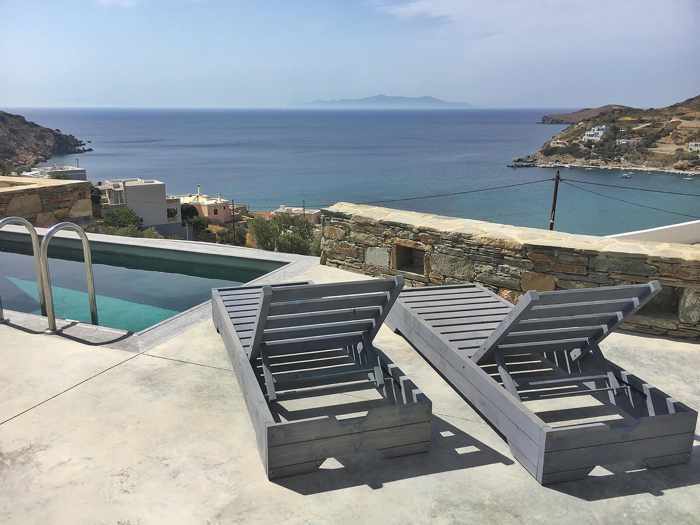 The apartments consist of a living room, bedroom and private bathroom, and each has either a balcony or a veranda offering a view to the Aegean Sea and sunset. The apartments are equipped with a fridge and kettle for guests’ convenience, but breakfast is included in the room rate. The property has an outdoor swimming pool, a snack bar, and a common veranda where guests can sit and savour the beautiful Kini scenery. Further descriptions and photos of the property can be found on the website, as well as the Captain’s page on Facebook, and in the Captain’s listing on booking.com. There are more than a dozen photos of the Captain’s Instagram feed as well. Travellers can contact the hotel for information, and even make bookings, through the reservation and messaging options on the Facebook page. Since staff have been busy with renovations, they haven’t yet had the chance to update the various sites with new photos, but are planning to do so. Below are four photos that Captain’s provided for publication in this post. The sleeping area in one of the apartments. 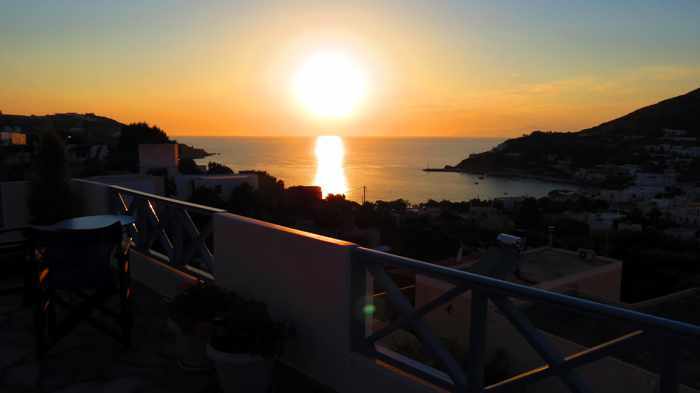 … and enjoy unobstructed views of Kini, the sea, and nearby islands. 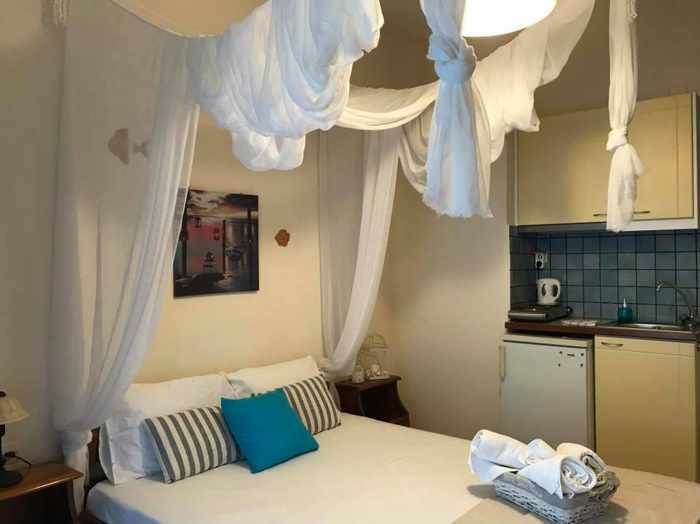 The building formerly known as the Apollon apartments was upgraded in 2018 and converted to a hotel — Horizon Blue — with “a more vibrant and fresh image.” The hotel has 30 spacious, non-smoking units which include a selection of double and twin rooms that sleep 2 persons, as well as triple rooms, all with a simple but pleasant traditional decor. Some rooms have direct sea views, while others are positioned with views of the nearby mountains. 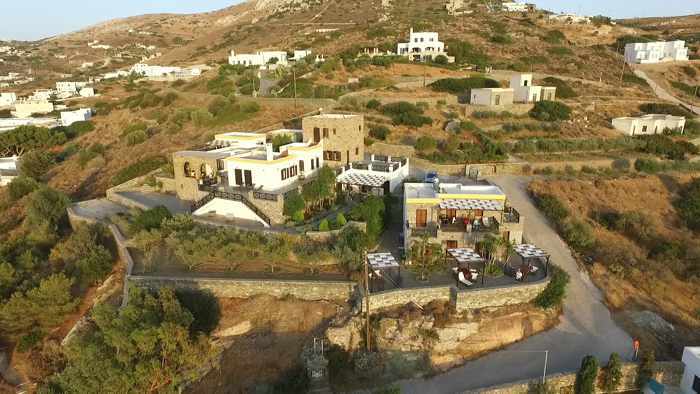 The hotel provides a breakfast buffet with hot and cold items, which guests can enjoy on a a common-area veranda with superb views of the village, bay and sunset.. Other hotel facilities include a garden and a restaurant/bar serving snacks and traditional Greek dishes. Photos and detailed information can be found on the hotel website, while additional photos can be seen on the Horizon Blue Facebook page, on the hotel’s Instagram feed, and in the Horizon Blue listing on booking.com. 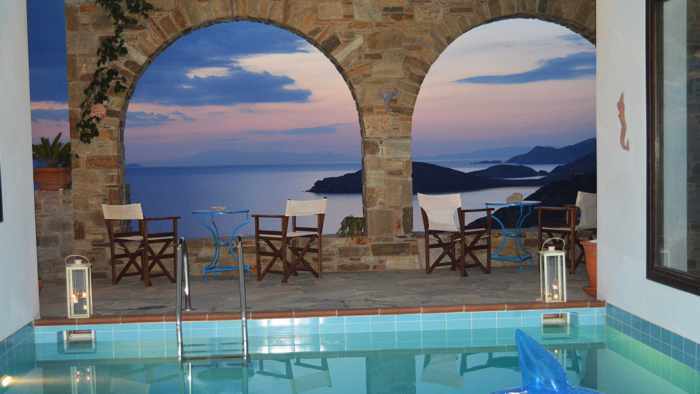 Syrou Lotos is another hilltop hideaway offering room and apartment accommodations with faboulous scenic views. 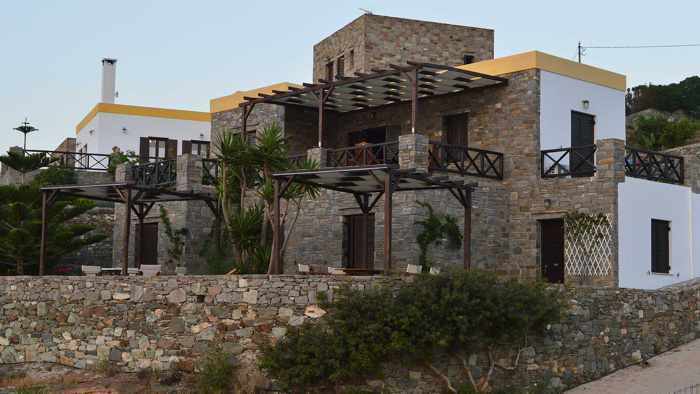 Hosted by Iosif Roussos, the stone-built buildings in the complex have eight different room configurations including twin and double rooms that sleep 2 adults each; 1-bedroom apartments that can accommodate 2, 3 or 4 people; and a 2-bedroom apartment that can accommodate 5 adults. 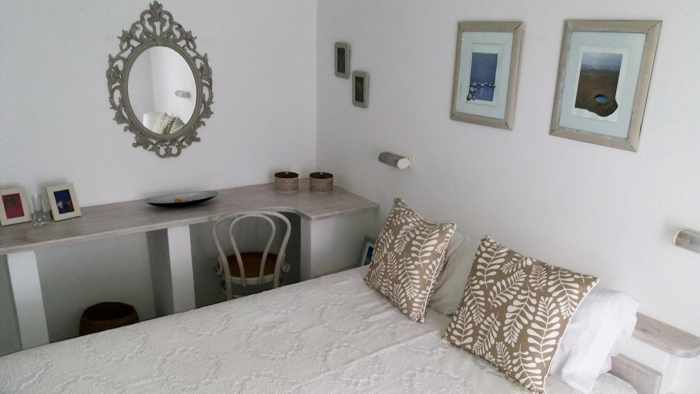 Each room is furnished with a kitchen or kitchenette equipped with a mini fridge, kettle and coffee maker, and has either a balcony or a veranda with views of the sea, garden or mountains. There also is a swimming pool; it’s partially sheltered by walls, but is open-air, right next to a terrace from which guests can take in the fabulous panoramic views. The Syrou Lotos website contains galleries with photos of the facilities as well as the interiors of the rooms and apartments, while more pictures can be viewed in the Syrou Lotos listing on booking.com. The property does not appear to have either a Facebook page or Instagram account. 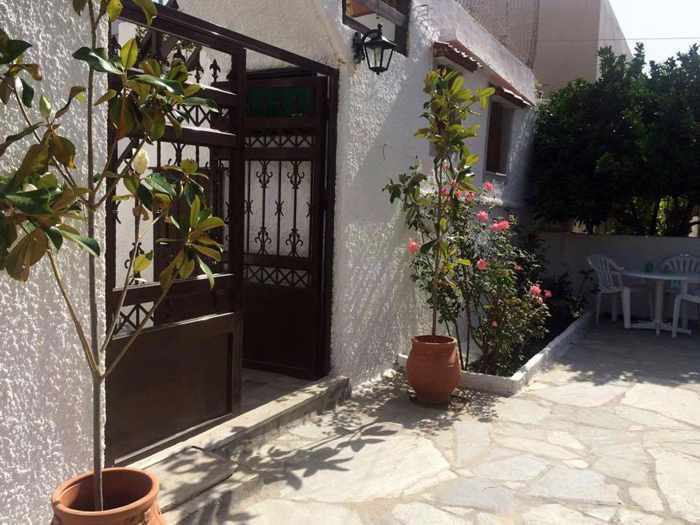 Below are descriptions of accommodation properties situated in the main Kini village area within easy or reasonable walking distance (less than 5 minutes) of the beach, restaurants and minimarkets. 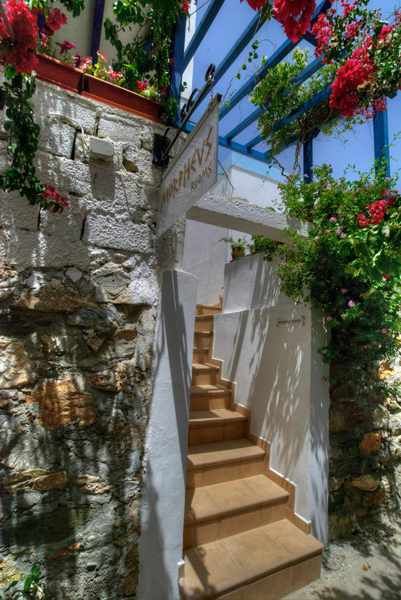 Since the terrain is fairly level, most if not all of these places will be suitable or ideal for visitors with mobility issues; however, at some properties, guests may have to climb some sets of stairs to enter the premises or reach certain rooms or facilities. New since we were last in Kini, the Aphrodite Boutique Hotel has opened in a building that previously bore large signs reading “Therapists Without Borders” on its upper walls. The property looked vacant whenever we walked past, since there were no open windows or doors, and we don’t recall seeing any signs of activity or occupancy. We assumed the place may have been a hotel that had shut down, or a studio apartment building that simply wasn’t yet open for the season (our visits to Kini were both in low season when the village wasn’t busy with tourists). We always felt the building had great potential as a hotel, particularly because of its prime location just a few dozen steps from the beach, so we were happy to learn it got a new lease on life in 2018 as a boutique inn. 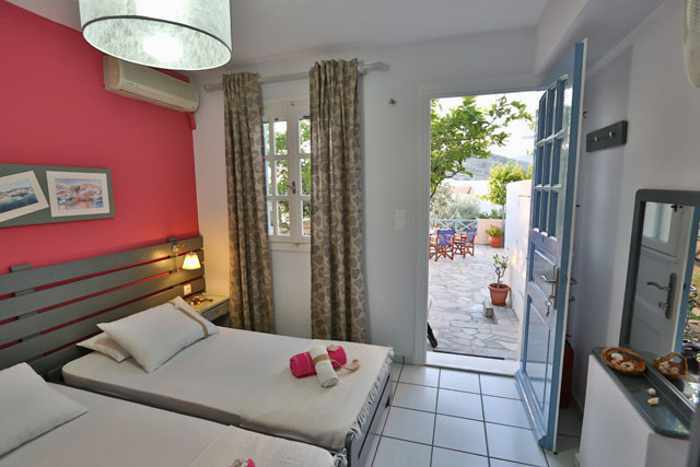 Aphrodite has 12 rooms including doubles, triples and a 2-bedroom apartment , as well as a breakfast room (breakfast is included in the room rate) and a rooftop garden terrace & bar. 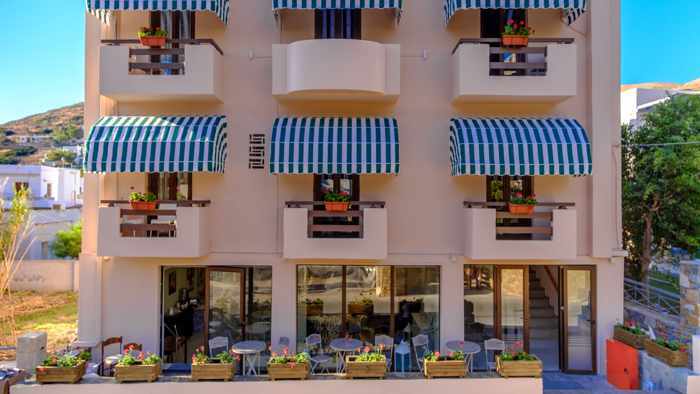 With tables and flower boxes placed along a terrace in front of the building, the hotel has made a strong visual improvement to area and has livened up the streetscape. 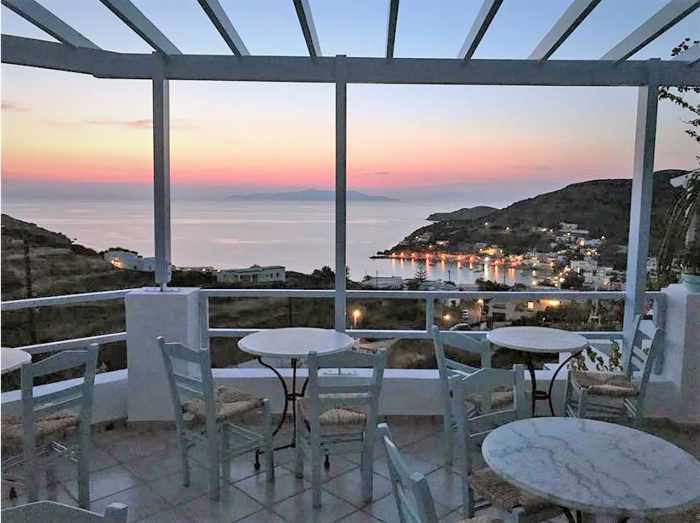 Photos can be viewed on the hotel website, the Aphrodite Boutique Hotel Syros page on Facebook, and Aphrodite’s listing on booking.com. There also are a few pics on the hotel’s feed on Instagram. 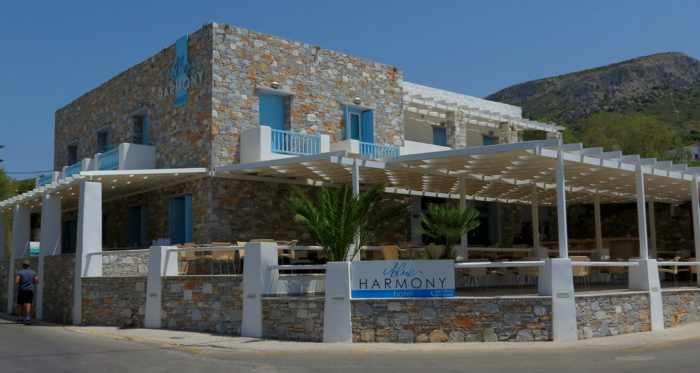 One of two hotels situated on the road that runs next to Kini beach, Blue Harmony occupies one of the best and most convenient locations in the village — it’s mere steps from the sandy beach, local bus stop, and all the restaurants. 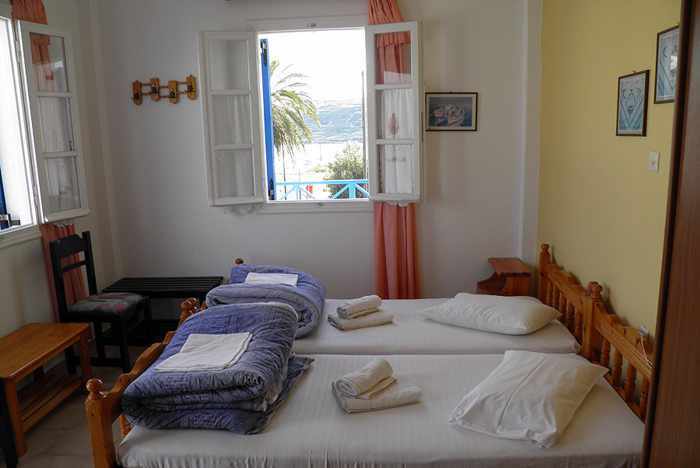 Accommodations include a variety of double, twin and triple rooms, most of which have sea views, as well as a family room and quadruple room, each of which can sleep four persons. 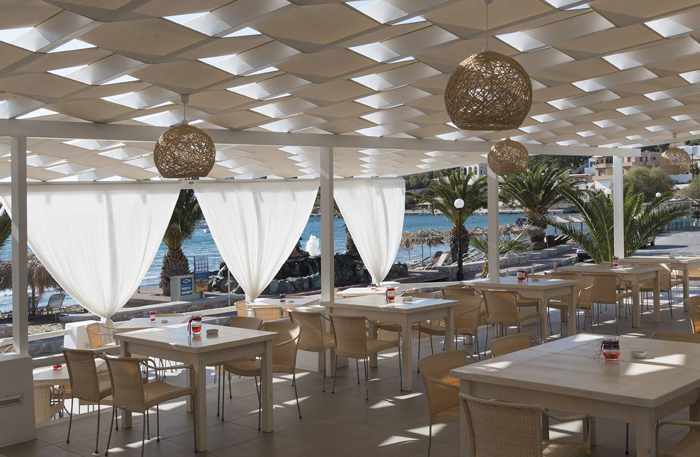 The hotel serves breakfast and has a spacious front veranda where coffee, bar drinks, snacks and light meals can be ordered. It also has its own sunbeds for guest use on the beach directly across the road. Blue Harmony operates from May through September. An online acquaintance of mine stayed here in 2018 and made highly complimentary comments about the hotel and its staff; he and his wife enjoyed it so much they will be staying there again this spring. A full description of hotel facilities and amenities, plus a few photos, can be found on the Blue Harmony website. More pictures can be seen on the Blue Harmony Instagram page, while a wider selection of photos is available on the Blue Harmony Hotel page on Facebook. Additional information and pictures can be obtained from the Blue Harmony listing on booking.com. 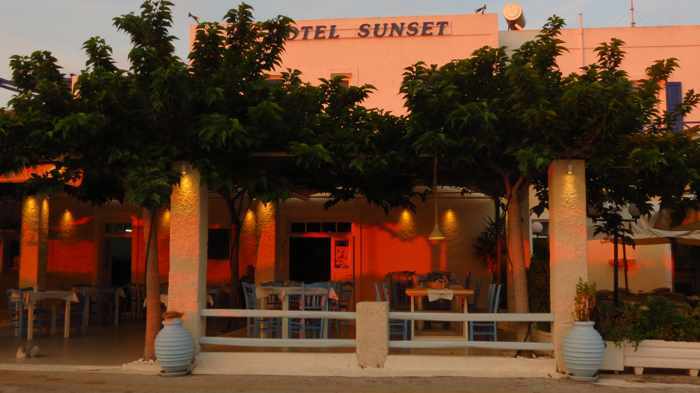 The older of the two hotels centrally-located in a prime position on the beachfront road, Sunset Hotel has a selection of double rooms, some with sea view and some with balconies. 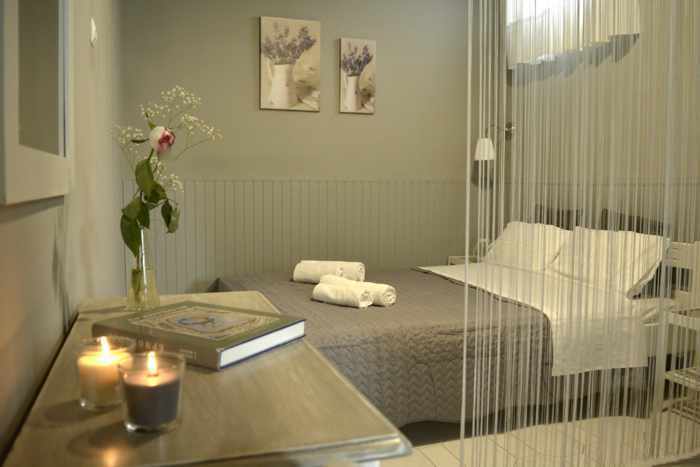 The accommodations were renovated and freshened up during 2018. 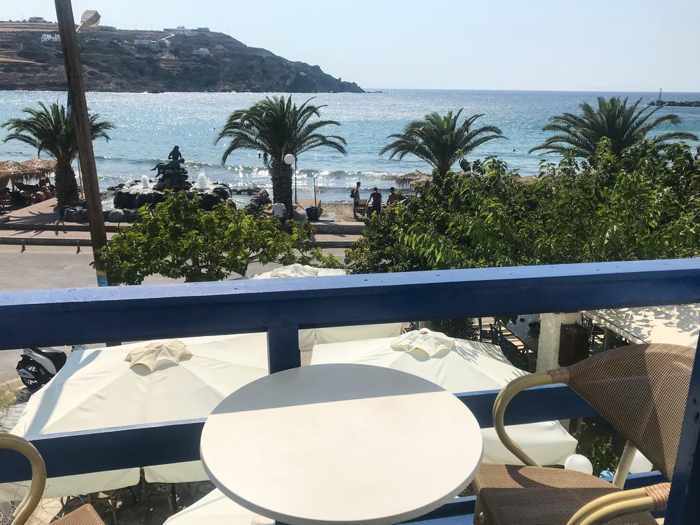 The hotel has a breakfast area as well as a ground-floor open-air restaurant, Stou Zaloni, where we have twice enjoyed delicious traditional Greek cuisine while watching the sunset. The hotel doesn’t have a website, but the Sunset Hotel page on Facebook does have photos of the property as well as contact information and a link to send direct messages. There is a small selection of photos on Sunset Hotel’s Instagram feed, while considerably more photos and information can be found in the Sunset Hotel listing on booking.com. 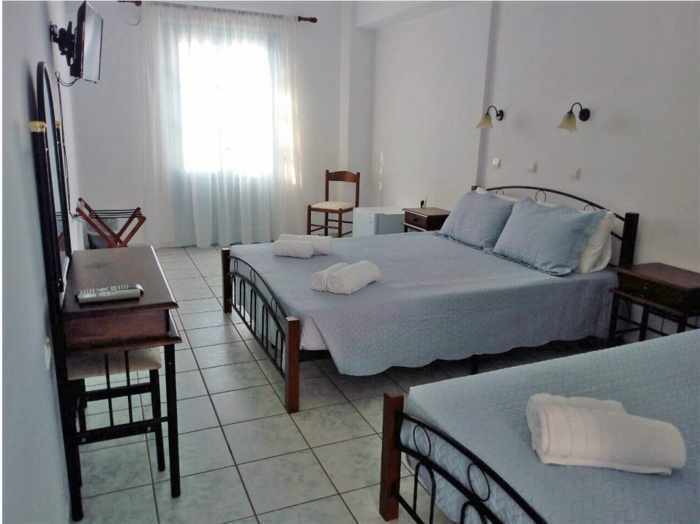 Situated just a stone’s throw from the Kini beachfront road, Apanemia Rooms has five different studios that include rooms with double, triple and quadruple occupancy. 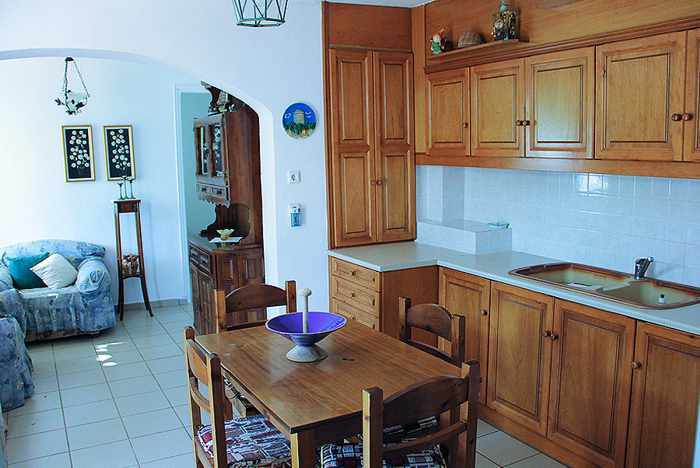 The studios are equipped with kitchenette facilities and have private balconies or verandas. Free parking is provided. 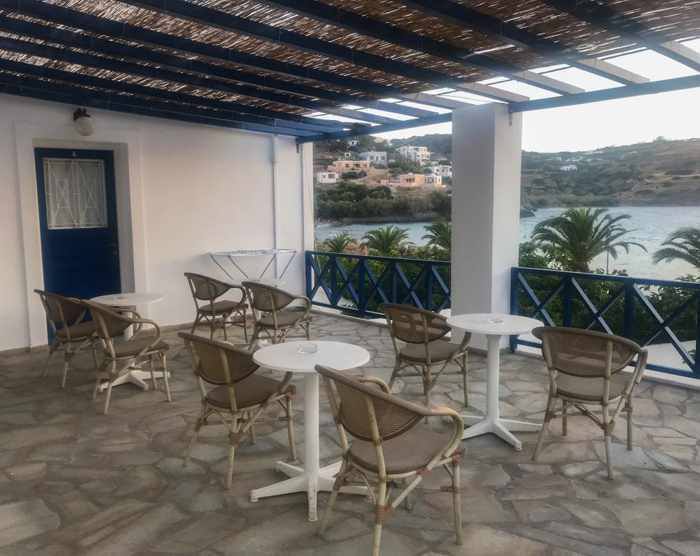 Apanemia has been operated by the Antoniadis family since 1980, and recently renovated its rooms and amenities, which includes a pleasant tree-sheltered garden patio with BBQ facilities. Additional information and photos can be found on the Apanemia Rooms website, as well as in the Apanemia Rooms listing on booking.com. A room interior photo from Apanemia’s listing on booking.com. Apanemia guests can relax on the property’s cheery, tree-shaded patio, seen in this photo from the booking.com listing. 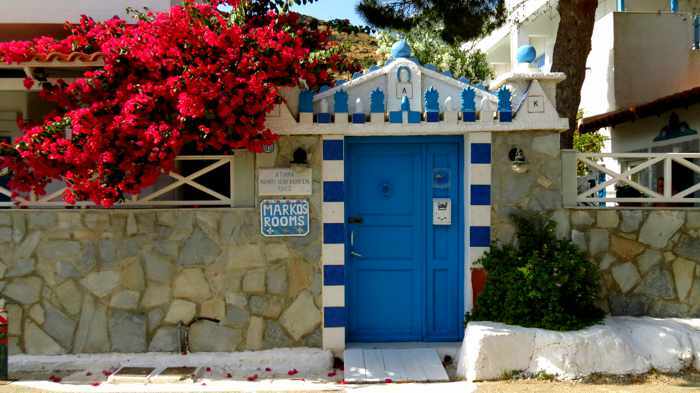 I haven’t been inside Markos Rooms yet, but we have walked past it many times — with its bold blue and white entrance gate topped by brilliant red bougainvillea blooms, it’s impossible to miss. Designed in traditional Cycladic style, the Markos complex offers a variety of double rooms and apartments that can sleep 2, 3 or 4 persons. Rooms are equipped with air conditioning, television, refrigerator and kettle. Some rooms have private terraces, but all guests can gather and relax in the large, lushly-landscaped ground-floor garden courtyard. 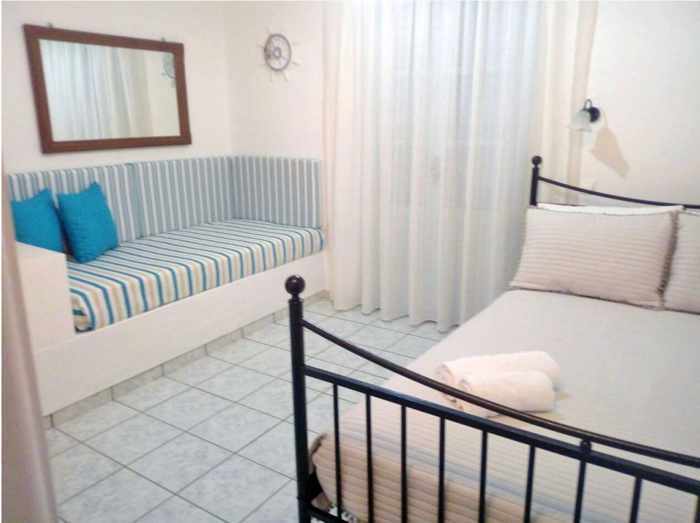 I once read an online travel forum post in which a regular visitor to Kini recommended Markos Rooms, describing it as a very comfortable, friendly and social place that draws a lot of repeat guests. When we have walked past in the evening, it has certainly sounded like that — we have overheard people having a good time laughing and chatting in the courtyard on the other side of the big stone wall that surrounds the property. 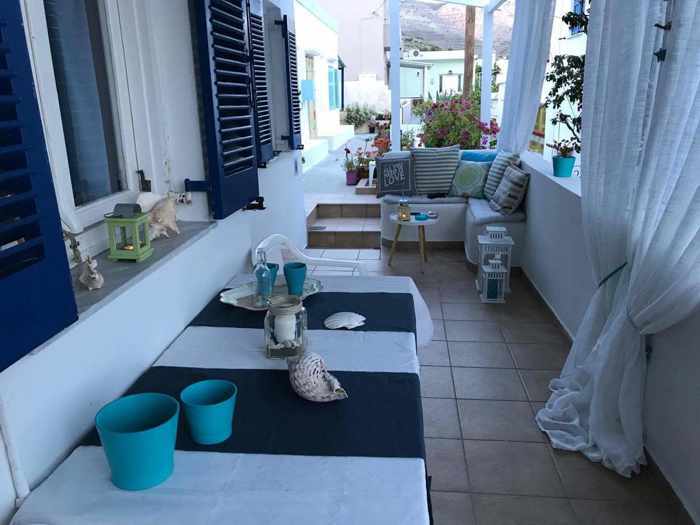 There is a Markos Rooms page on Facebook; however, no posts have been added to it since 2017, and the link that it provides for a website will direct you to accommodations in Oia village on Santorini instead. (I have messaged Markos Rooms to ask if they are aware of this error.) 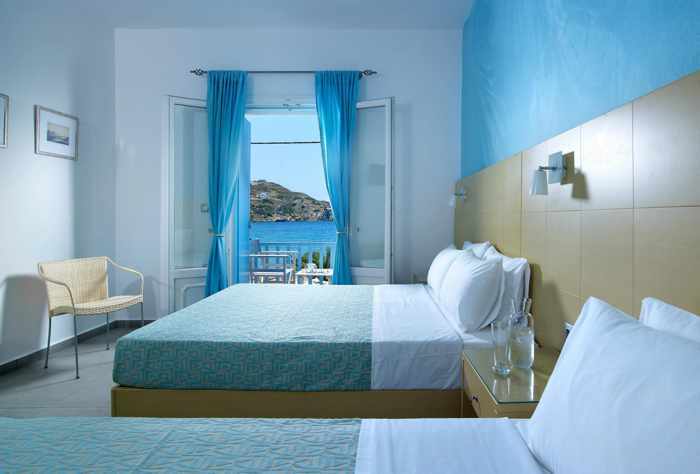 Markos does not appear to have a listing on booking.com, but the Markos Rooms listing on the visitsyros.com travel website does have an online booking link where room availability and other information can be found. This slideshow dates from 2013, but gives a good overview of the Markos Rooms property as well as some scenes from the Kini area. There are many more photos of Kini and the accommodations on the Markos Rooms page on Facebook; however, that page has not been actively updated since August 2017. 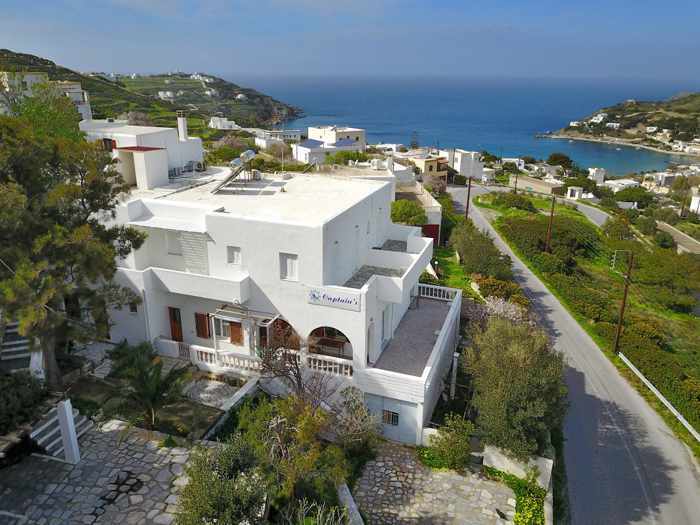 On its website, Argo Studios describes itself as a “small haven of peace and quiet” just 250 meters from the beachfront. 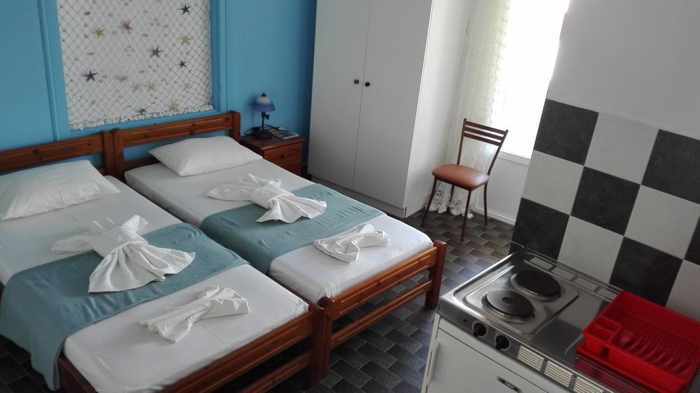 The building is designed in traditional Aegean architecture, and contains a selection of 17 rooms and apartments — including double, triple and quadruple rooms equipped with kitchenettes — that can sleep up to 4 people. 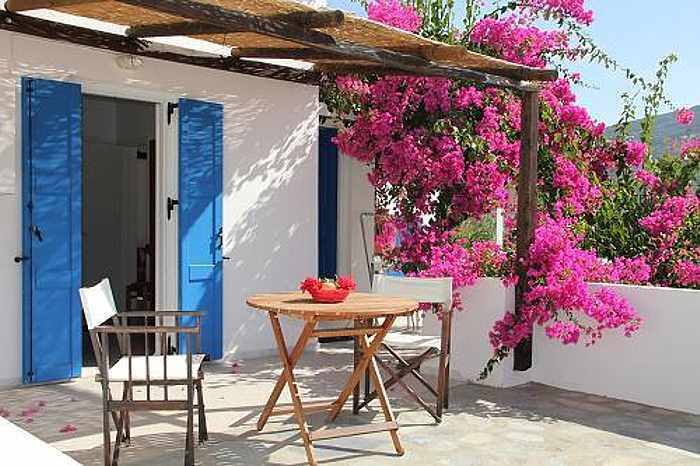 The rooms have balconies or verandas offering views of the village or sea. The property has a lounge and bar area, garden, and parking for guests. 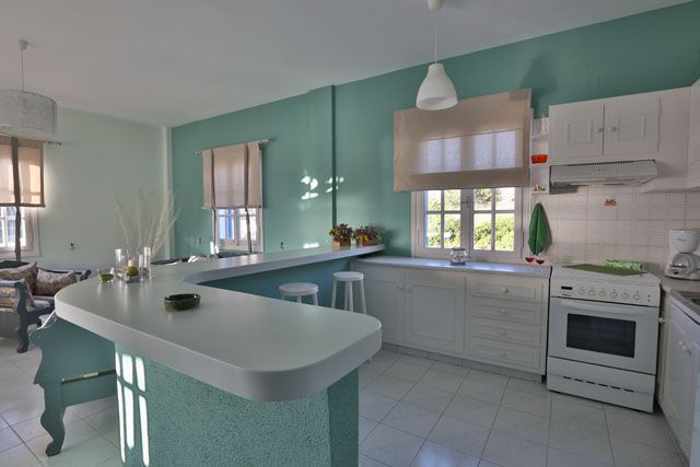 The Argo website includes interior and exterior view photos of six different room types, as well as information about Kini in particular and Syros in general. It also has a contact form for availability and reservation inquiries. Rooms also can be reserved through the Argo listing on booking.com, where there are additional photos of room interiors, balconies, and scenes from Kini. 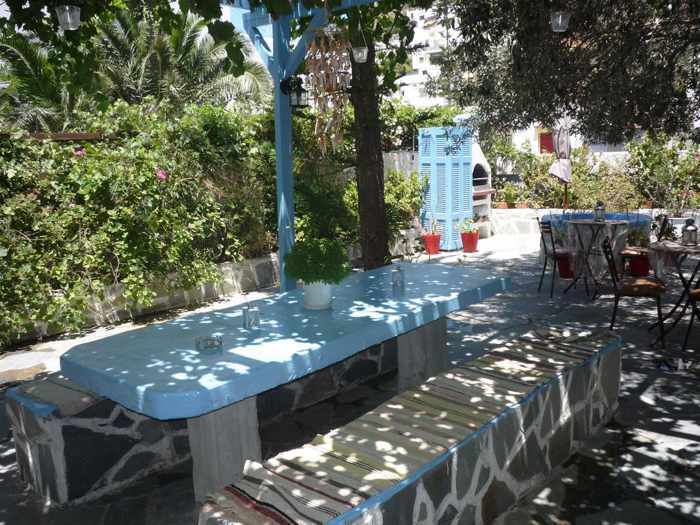 Hosted by Petros Kanakaris, Morpheus Rooms is situated along a quiet lane less than 50 meters from the beach strip. 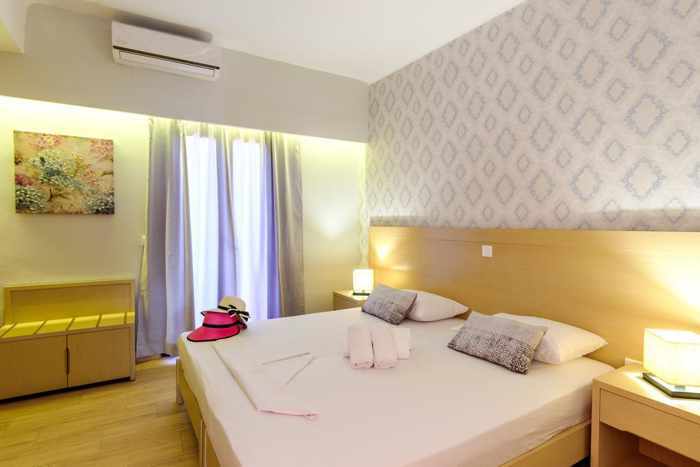 The 2-storey property offers six different accommodation options, including a studio with twin bed for just 1 person; studio apartments that can sleep 2 or 3; a 1-bedroom apartment that can sleep 3 persons; and a ground-floor, 2-bedroom apartment that can sleep 5. The rooms are equipped with refrigerators and cooking facilities. Rooms on the ground floor share a veranda, while those on the second level have a common veranda space as well. 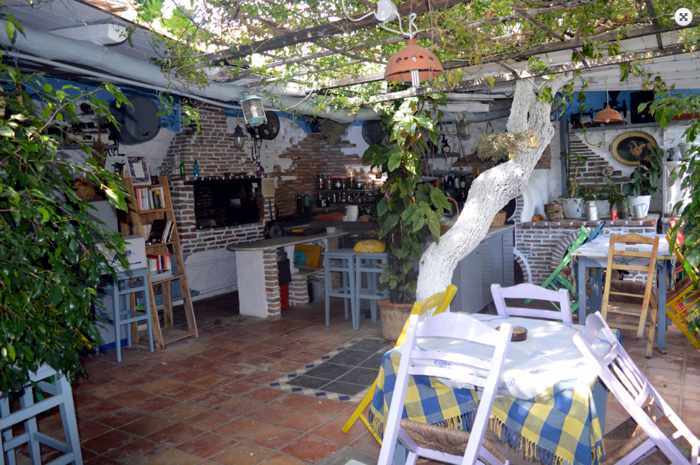 The Morpheus Rooms page on Facebook is chalk full of photos of Syros as well as links to articles and videos about the island. There are photos of room interiors as well (I have posted a few below). Additional photos can be seen in the Morpheus Rooms listing on booking.com. 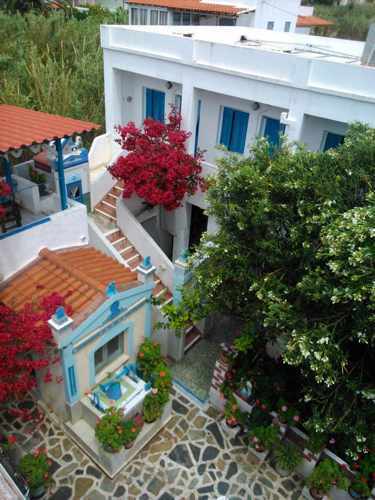 Hosted by Antonis and his wife, Roula, Aposperitis Rooms & Apartments is a 2-storey accommodations building in an oasis of lush flowers , plants, bougainvillea and olive trees. It’s located in a quiet neighbourhood of Kini where there is no through traffic, and it’s approximately 350 meters from Kini beach. 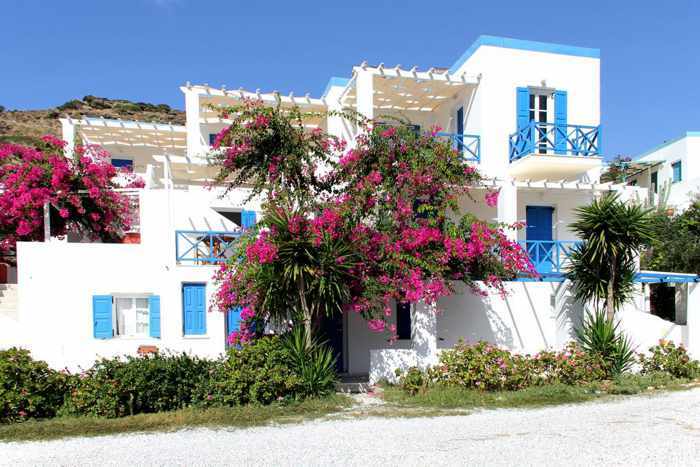 The property features 8 studios and 2 apartments, each individually decorated in traditional Greek style. 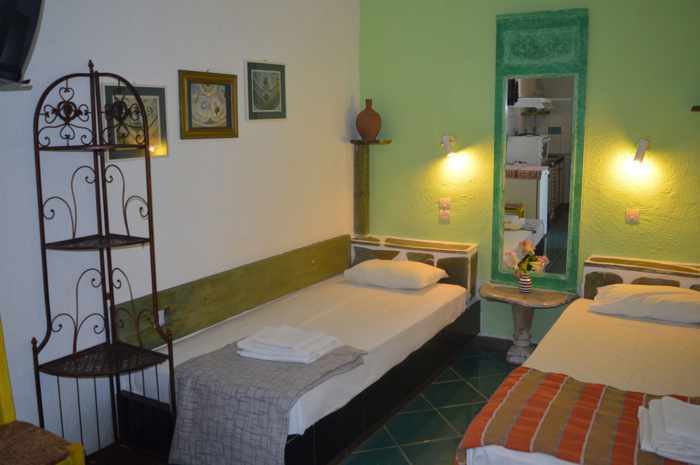 All rooms are equipped with kitchenette facilities and, depending upon the particular room, can sleep 2, 3 or 4 people. 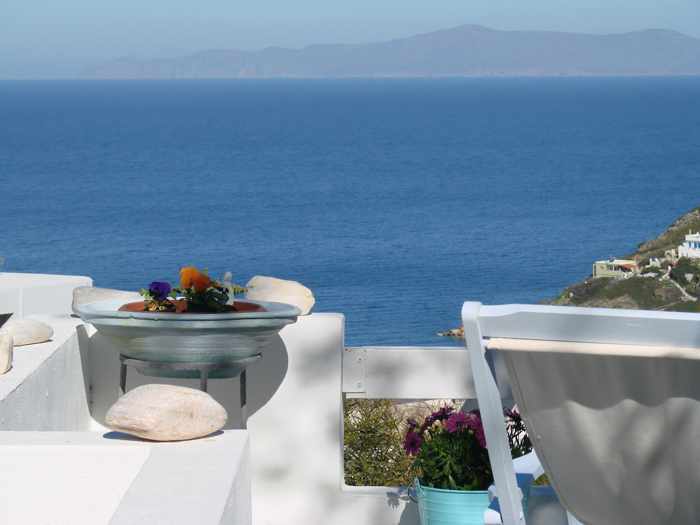 Rooms have spacious verandas, and some of the balconies offer sea views. All guests have access to a shared courtyard BBQ courtyard where they can relax or socialize with other visitors. The property has parking for visitors arriving by car, and pets are welcome. 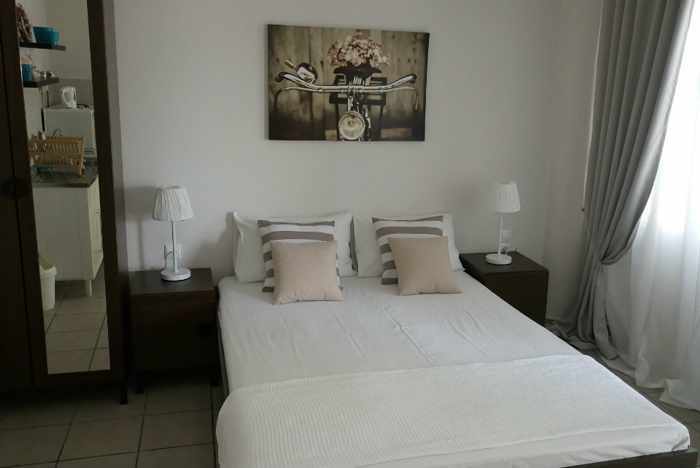 The property’s website includes photo galleries with pictures of the various apartments as well as the common areas and grounds, while additional photos can be viewed on the Aposperitis Rooms page on Facebook. as well as its listing on booking.com. 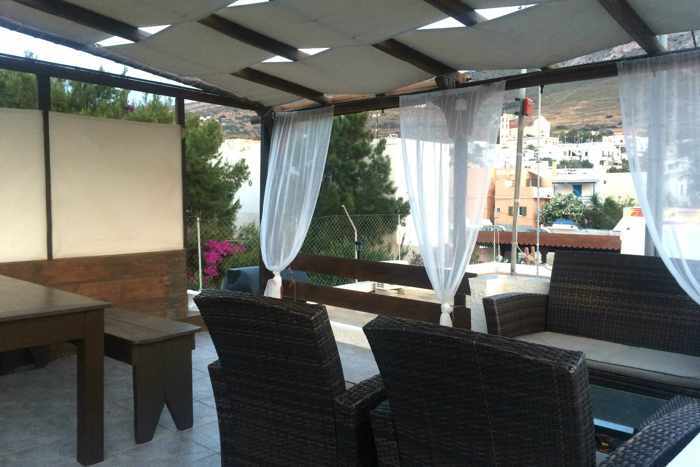 Room 9 boasts a huge terrace with mountain and valley views. The photo appears on the Aposperitis website and Facebook page. 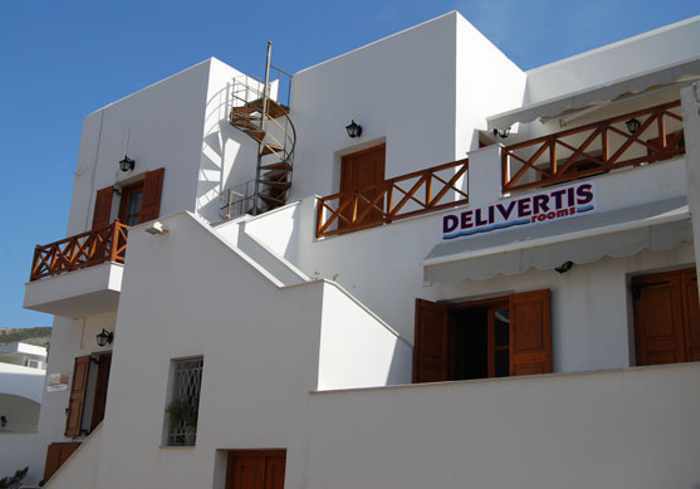 Operated by owner Margaro Deliverti since 2003, Delivertis Rooms is situated along a narrow road just 15 meters from Kini’s beachfront strip of tavernas. 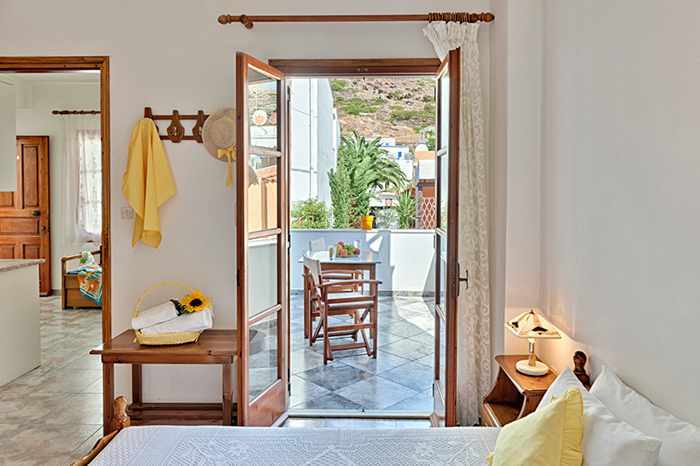 The property has kitchenette-equipped studios and apartments that boast large private balcony or terrace spaces. 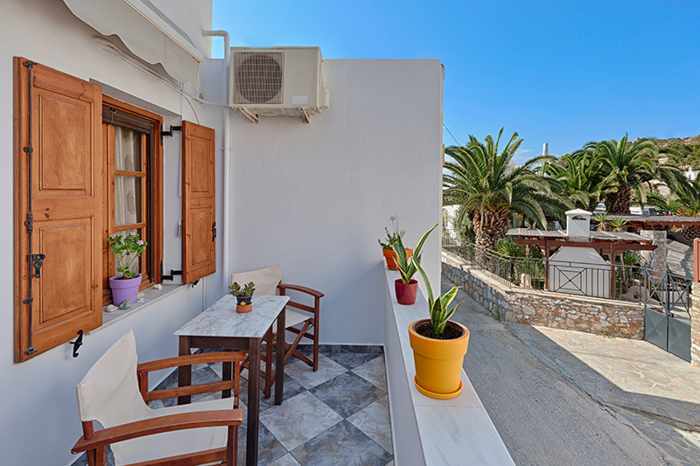 The website includes an album with photos of the flats as well as some scenes from Kini, while the Delivertis Rooms page on Facebook contains additional images of the property and numerous pictures and videos of places on Syros. For room availability and reservation inquiries, Delivertis Rooms can be reached through either the Contact page on its website, or through the contact and messaging options on its Facebook page. 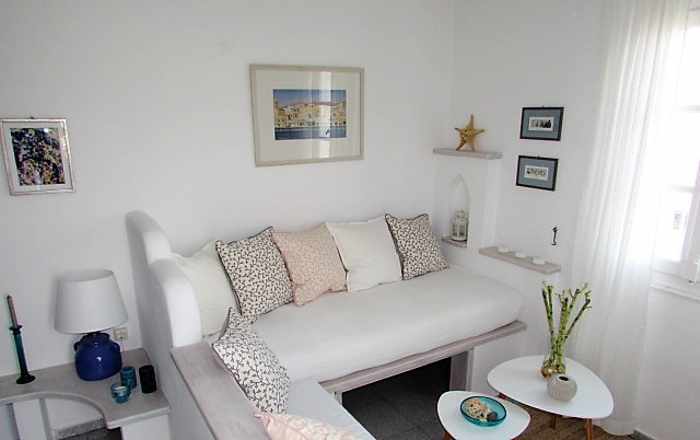 This image from the Delivertis Rooms website shows part of the interior of Apartment 1, as well as its spacious private terrace. 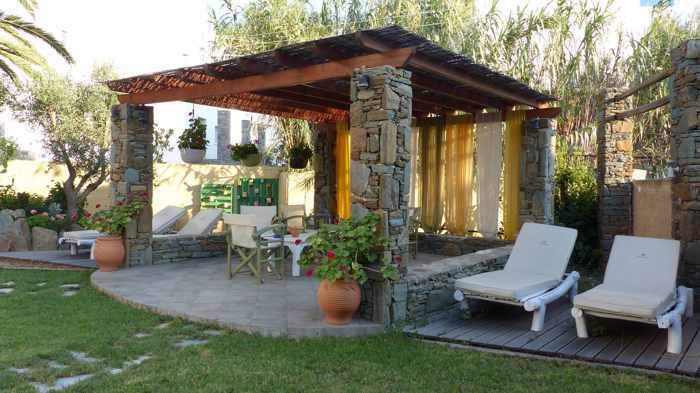 Located about 100 meters from the waterfront, Ligaries Studios is a family-run property positioned in a lush and quiet garden setting. 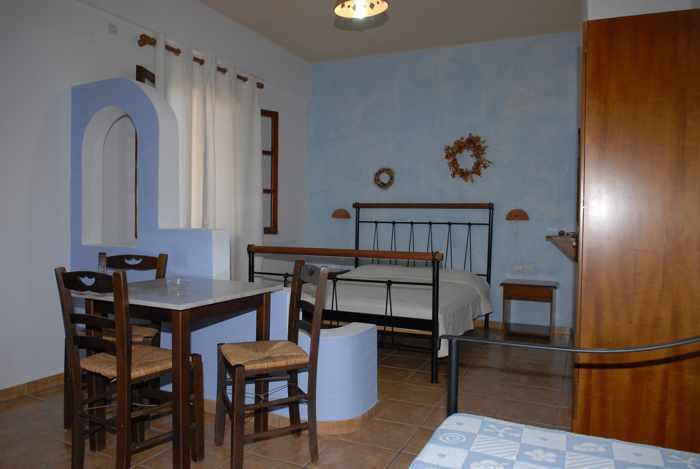 Accommodations include a double room, a studio that sleeps 2, a studio for 3, and another studio for 4. 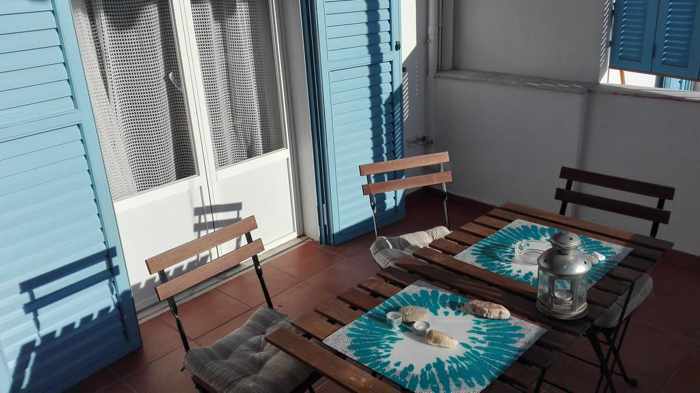 The single-room studios are equipped with kitchenettes, and have either balconies or verandas that offer garden or mountain views. The landscaped grounds include comfortable, furnished areas for sitting and lounging in the sun. The Ligaries website is still under construction, so I would recommend contacting the property through the messaging links on its Facebook page, which features photos of room interiors and the outdoor amenities. More pictures can be viewed on the Ligaries Studios Instagram feed, as well as in the Ligaries Studios listing on booking.com. Situated a short stroll from the Kini village waterfront, Magnolia Senses was built in 1985 and has a selection of accommodations that can sleep up to 5 people, including a 1-bedroom apartment for 2, a studio apartment that can sleep 3 or 4 people, and a 2-bedroom apartment for up to 5 persons. 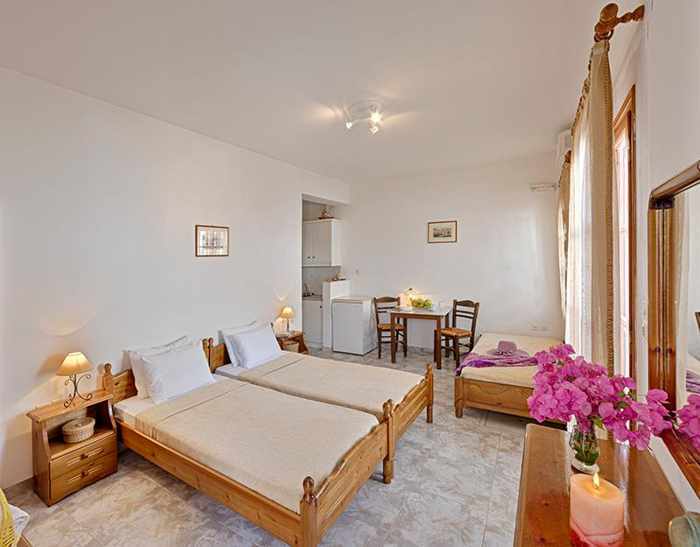 The rooms include fully-equipped kitchenettes, and guests have access to a rooftop veranda and the lush garden grounds. Pets are welcome, too. For availability and reservations, the property can be reached through the contact page on its website, or through the messaging function on the Magnolia Senses page on Facebook. More photos of the apartments also can be viewed on the website, its Facebook page, and its listing on booking.com. Renovated and upgraded several years ago to feature a crisp minimalist decor, contemporary fixtures and luxe furnishings and amenities, the property’s four studios look like something you would see featured in the pages of a leading interior design magazine. There is one suite — the Mediterranean, which boasts a 43-inch smart TV with Internet browser, Netflix and streaming channels — and three studios, all of which sleep 2 persons. Each unit is equipped with kitchenettes, coffee and tea making appliances, high-quality mattresses and linens, and Korres brand personal care products. 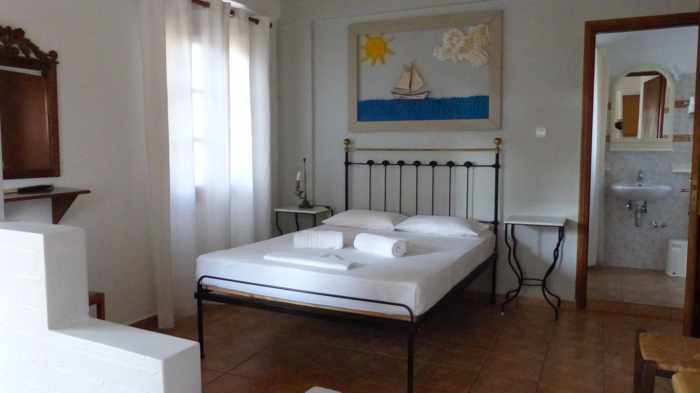 The website is packed with photos and descriptions of the suite and each studio, while the Loukia Studios page on Facebook has more than 30 photos of the Mediterranean suite. Availability inquiries and reservations can be made through a contact page on the Loukia website, while rooms occasionally are available through the Loukia listing on booking.com.